Not so long ago we took to the skies with the ballooning Montgolfier brothers and today we're off into the clouds again, this time in the company of Jeanne-Geneviève Garnerin, an intrepid lady whose exploits caused a sensation throughout Europe. 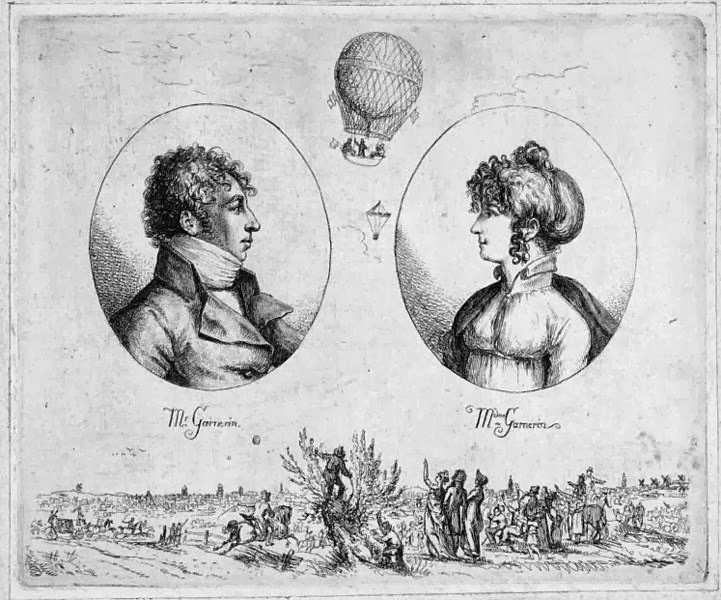 On 12th October 1799 Jeanne made history when she became the first woman to make a parachute descent from a hot-air balloon, joining her husband in the narrow field of ballooning and parachuting pioneers! 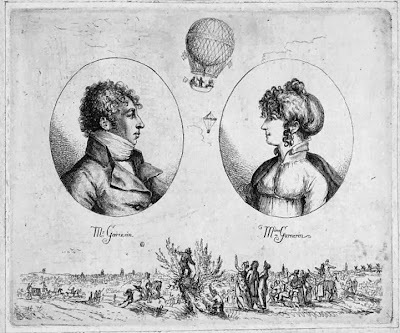 Born Jeanne-Geneviève Labrosse in Paris in 1775, the young woman was among an enthusiastic crowd who gathered to watch André-Jacques Garnerin fly his hydrogen-powered balloon at Parc Monceau on 22nd October 1797. 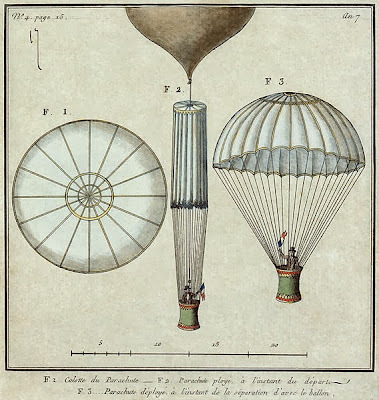 An innovator in the world of ballooning, Garnerin causing a sensation when he piloted his gondola safely, if a little bumpily, back down to earth with the help of a silk parachute of his own design. Jeanne was fascinated by what she had witnessed and signed up to become a pupil of Garnerin, eventually flying with him on 10th November 1798, four months after he courted controversy by taking a highly-publicised flight with another young lady! Jeanne proved herself a natural balloonist and was the first woman to undertake a solo ascent. Buoyed by the successful flight she set her sights on another ambition, determined to be the first woman to parachute down to earth using her tutor's tried and tested method. With much fanfare Jeanne made her 900 feet descent on 12th October 1799, proving beyond a doubt that the press and public need not fear about the possible damage high altitude and fast descent might cause to the delicate female constitution! Her achievements were celebrated throughout France and she toured the continent with Gargerin repeating the feat, lauded where she went. Finding in Garnerin a kindred spirit, Jeanne married the balloonist and in 1802 filed a patent application for "a device called a parachute". 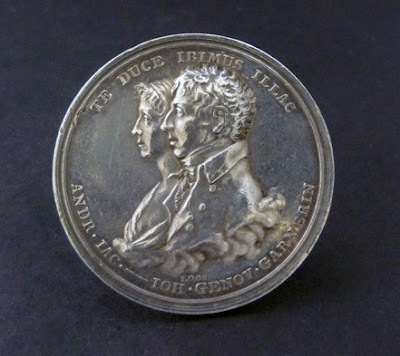 With continental Europe conquered by the intrepid Garnerins and André-Jacques appointed Official Aeronaut of France, the couple turned their attention to fresh pastures and travelled to England in 1802. Once again their demonstrations proved enormously popular and Jeanne outdid herself, making a successful descent from 8000 feet over London. The couple remained in England until war broke out in 1803 at which point they returned home to resume their career in France. When André-Jacques died in 1823, Jeanne retired from the ballooning life and passed the reins on to her niece, Elisa Garnerin. By the time Jeanne died in 1847 Elisa was celebrated across Europe for her own ballooning exploits, inspired by the aunt who had caused such a sensation! This is an intriguing story! I love the idea of a parachuting couple and it's quite hilarious that 900 feet should be considered a high altitude. 8000 feet over London! Now you're talking. That must have been spectacular. I had no idea that the parachute was invented as long ago as this! Seems strange that they didn't give them to pilots during the First World War, but I also know that was because they were afraid it would encourage pilots to jump out! It must have been quite a feat to witness, especially with the added thrill of seeing such an intrepid lady! Tweeted and shared, with pleasure. She would make for an interesting branch on the family tree! Madam Gilflurt, you source the most fascinating stories. I have tweeted and shared. This is so amazing! Parachutes as long ago as that. Wow. I always look forward to your posts. Not a dull one yet. I am blushing - thank you!